Discover new ideas on how to make berry sauce from Aronia berries. We believe it very easy to find a blueberry alternative that is healthier. We suggest using our fresh frozen aronia berries from Blazerfarmz for this recipe. – find the recipe for Honey-Ginger Aronia berry Sauce listed below. Directions: The sauce maybe spooned over ice cream, cheesecake, and even lemon pound cake. All you need a grill pan or you can use your outdoor grill. Val’s recipe combines nature’s best antioxidant the Aronia berry as a wonderful alternative fruit in her parfait. Aronia berries are a unique food that promotes natural wellness. We suggest using our fresh frozen fruit from Blazerfarmz for this recipe. Directions: Use the auger to push fruit into the blade to create an ice-cream consistency. (If your blender will not smooth out the frozen fruit without liquid, add a little coconut water until it starts turning freely.) Blend until smooth, pour into glass dishes, place in the freezer for 15 minutes to an hour. Do not wash out the blender. You will be making the topping in the same pitcher. The “left-over” dark purple sorbet that is still in the blender will create a beautiful violet hue for the topping. Directions: Blend until smooth, pour over the aronia berry sorbet, return to the freezer until firm. Top with thawed aronia berries. Kefir combined with Aronia is a drink popular across Eastern and Northern Europe is a excellent way to start the day with our healthy dark berries. Try our all natural heartland grown fruits in your smoothies. What could be better than a unique aronia berry smoothie that promotes weight loss and super health. Our berries are a natural food from America. We highly recommend our Aronia berries as an alternative to acai. Try them in our favorite smoothie recipe. A wonderful combination of grilled fish, fruit and fresh herbs. The surprise here is our recipe is with the lesser known aronia berry, aka the chokeberry which is becoming a hot new native berry that is worth taking a look at. Try this heirloom fruit in your own recipes and support our locally grown food. Directions: In a small bowl, coarsely mash 1 cup aronia berries. Stir in the onion, cilantro, jalapeno, orange juice, vinegar, 1 teaspoon of olive oil, 1/8 teaspoon salt, pepper and remaining aronia berries. Cover and chill until serving. Next, brush fillets with remaining oil; sprinkle with remaining salt. Grill fillet, covered, over medium heat for 4-5 minutes on each side or until fish flakes easily with a fork. Serve with salsa. Yields: 6 servings. Directions: Lightly salt and pepper the fillets. Add oil to your pan and roast fillet for 5-7 minutes a side until golden brown or optionally pre-heat oven to 400 degrees and place fish in the oven for 5-6 minutes to brown verses pan roasting. Create the sauce adding blackberry liquor or cranberry juice to hot pan and let it simmer for aprox. 1 minute under heat, then add a splash of lemon juice and rice wine vinegar then add in bruised aronia berries with a pad of cold butter and saute until butter is melted. Then laddle over fillet and add toasted hazelnuts. Yields: 4 servings. Native American food never tasted so good. The little know Aronia berry was special food used for health and wellness by the early Native American’s. We encourage you to try our native berries. Directions: Roast the corn. Whether you choose to grill or broil start by soaking the corn in water in its husk for 10-15 minutes. Put it on the grill or under the broiler and cook for about 12 minutes, rotating the ears every few minutes. If broiling it, you’ll do best by placing it parallel to both the heating elements and the rungs on the oven rack so it cooks evenly and is easy to turn. When finished, remove from heat and let it cool in the husk. When it is cooling, chop the basil into thin strips, and toss in a bowl with the aronia berries. Cut the corn from the cob and add to berries. Add oil, salt, pepper and red pepper flakes and toss to coat. Yields: 2-3 servings. Directions: Set a small saucepan over medium to high heat and add in the aronia berries. Add the remaining ingredients and bring to a boil. Boil for about 8-10 minutes, stirring every few minutes, until thickened. Turn off the burner and let stand. Sauce should be thick, kind of like fruity jam, with some of the berries burst and some whole. Taste and add more honey if you like. Honey Ginger Aronia Sauce recipe is a great fusion of flavors. The dark purple aronia berries have a number of unique qualities specifically health, color and taste. We recommend them as an excellent choice as something new and healthy to try. Directions: Combine ingredients in a small bowl and let sit for twenty to thirty minutes for flavors to blend. Serve with tortilla chips or over grilled Teriyaki salmon or Husker pork chops. Directions: Heat oil in a large saucepan over medium heat. Add onion and cook, stirring occasionally, until tender and just starting to brown, 2 to 4 minutes. Add garlic and jalapeno and cook, stirring, until fragrant, about 30 seconds. Add bourbon, increase heat to high and bring to a boil; cook until most of the liquid has evaporated, about 5 minutes. Stir in aronia berries, ketchup, vinegar, brown sugar, molasses and allspice; return to a boil. Reduce the heat and simmer, stirring occasionally, until thickened for about 20 minutes. Here is a dark berry Chipotle BBQ sauce that summons up some rich & spicy flavors. We suggest using our aronia berries for this recipe. Directions: Preheat canola oil in a medium-sized pot over medium heat for 3-4 minutes. Once the oil is hot add the onion and shallot to the pot. Sweat the onions over medium heat for about 10 minutes, stirring occasionally, until translucent. Add the garlic to the pot. Stir. Cook for another 60 seconds. Add the stout beer to the pot and raise the heat to medium high. Allow the stout to simmer and reduce by half, about 15-25 minutes. While the stout is reducing, place the aronia berries, brown sugar and cider vinegar into a small sauce pan. Place over medium heat. Stir until the sugar is dissolved. Cook over medium heat until the aronia berries begin to break. Remove from heat and set aside. Add the aronia berry mixture and the rest of the ingredients for the bbq sauce to the reduced stout. Whisk. Reduce heat to medium and simmer for 10 minutes. Allow sauce to cool slightly then transfer to a blender. Blend until very smooth. Strain BBQ sauce through a fine-mesh strainer. Taste sauce and adjust seasonings as desired with kosher salt. Directions: Sift together flour, baking powder, salt and baking soda. In blender, combine egg, shortening, orange juice, and sugar. Add aronia berries (or juice) & nuts and chop briefly. Empty into flour mixture. Mix by hand until moistened. Bake in a greased 9″x5″ pan at 350 degrees F. for 50 to 60 minutes. A classic recipe for a fruit filled Middle Eastern holiday treat provides a perfect excuse to try our artisanal jams. Try our Aronia berry or Aronia-Currant Jam for the pastry’s sweet filling. Directions: Combine flour with sugar. Add milk, orange water and butter and knead. Optionally, add little more milk but don’t add too much to prevent the dough from being sticky Form walnut-size balls. For the filling use aronia jam either purchase or make it for yourself. See Aronia Jam recipe listed under Jams, Jellies & Syrups. With your fingers, make a hole in dough balls and stuff each ball with a teaspoon of the filling. Close the balls and form them any way you wish. Make the perfect pie. Discover Aronia berries also called Chokeberries of the black variety which have some incredible attributes, namley their dark skin which is loaded with flavonoids that are responsible for giving it’s berries that healthy dark purple color. Our fresh frozen berries are loaded with numerous beneficial vitamins that include B2, B6, E, C & folic acid as well as antioxidants. Directions: Combine eggs, sugar, salt and flour. Stir in the aronia berries. Pour into unbaked pie shell. Slowly pour whipping cream over the top, being sure to cover the entire area. Bake at 375 degrees F. for 10 minutes. Reduce heat to 350 degrees F. and bake a further for 50 minutes until filling is set. A healthier muffin that uses a heirloom fruit in a traditional recipe. The Aronia berry with a provenance that extends back to the early Native American Indians. Who knew? Directions: Cream together 1 cup of sugar and 1/2 cup of shortening and then add in egg yokes, 2 cups of flour, milk, baking powder and vanilla to the batter. Gently add 1 cup of aronia berries and then fold in 3 stiffly beaten egg whites. Next place the batter in a greased muffin pan. Make the topping by separately mixing in a bowl with 1 cup of melted butter, 1 cup of brown sugar and 1 cup of flour. Mix the topping together until its crumbly then add on top of batter before baking. Bake the muffins at 350 degrees for 20-25 minutes. Martha Stewart meets Dr. Oz for this recipe. Find raw or fresh frozen Aronia berries for this healthy, indigenous fruit scone recipe. Try our natural Aronia berries and understand why this is a most beneficial fruit is proudly Missouri grown. Directions: Preheat oven to 400 degrees. In a large bowl, sift together flour, 3 tablespoons sugar, baking powder, and salt. Cut in butter until the largest pieces are the size of peas. Stir in aronia berries and zest. Whisk ingredients together cream and egg in a liquid measuring cup. Make a well in the center of dry ingredients, and pour in cream mixture. Stir lightly with fork just until dough comes together. Turn out onto a lightly floured surface, and knead a few times to mix well. Pat dough into a 6-inch square about 1 1/4 inches thick. Using a floured knife, cut into four 3-inch squares. Cut squares in half on the diagonal to form eight triangles. Transfer to buttered baking sheet. Brush tops with cream, and sprinkle with sugar. Bake until golden brown, 20 to 22 minutes. Transfer scones to wire racks to cool. Yields: 8 scones. Try your hand at making the same type of Aronia berry Jelly with this recipe that we produce for the local farmers market. Our berries are 100% natural, grown pesticide free and are local to the Heartland. We encourage you to find out more about this unique food item. Directions: Wash fruit and cover with water, simmer 15 minutes. Strain the juice. Pour measured amount into a 6-8 quart non-reactive kettle such as enamel or stainless steel. Add lemon juice, pectin and stir. Bring to a boil, add sugar, stir, and bring to a full rolling boil. Boil exactly two minutes. Skim and pour into clean, hot jars. Seal. Yields: 4 pints of Aronia berry jelly. We love unique food recipes like our Aronia Lime Jam and highly recommend introducing any citris-like flavors to Aronia berries. We are family owned farms that take pride in growing a unique food items. Find out how to get Aronia for yourself and enjoy the gift of health. Imagine this syrup recipe over ice cream or hot pancakes. Aronia berries are simply an excellent choice. If you are a lover of elderberries, blueberries or currants you must try Blazer farms Aronia berries. Directions: Wash fruit and cover with water; simmer 15 minutes. Strain juice. Measure juice into a 6- to 8-quart kettle. Add pectin and stir. Bring to boil, add sugar, stir, and bring to a rolling boil. Boil exactly 2 minutes. Skim and pour into jars. The Blazer brothers love the fact that Old Orchard juices secretly use Aroniaberry juice as primary ingredient after apple in many of its juice blends. Try this refreshing drink recipe that features Aronia. Check out the O.O. online nutrition information for yourself and see why Aronia berry juice is coming on strong. Directions: Add aronia berries with honey to your favorite to tea. Note to Mixologist: Use quality rum, limes and fresh frozen Aronia berries for a purple berry delight. There is no oxidative stress here. Trust Me. Directions: Take your mortar & pestle and mash up the mint, limes and aronia berries. Add them to a highball glass, plus rum and ice and top off with club soda; stir. Garnish with a lime slice and mint sprig. Yields: 1 drink. Vodka and Aronia berries are simply perfect together just ask our Russian friends have been using Арония (Aronia) in mix drinks for years. For a real treat try our fresh frozen berries in your own cocktail. We can ship farm fresh berries directly to you. Directions: Muddle mint leaves, blend aronia berries and lime juice add simple syrup in a pitcher. Stir in vodka. Then add ice and top with club soda. Serve in a highball glass garnished with a mint sprig or skewer of aronia berries. Yields: 1 pitcher. 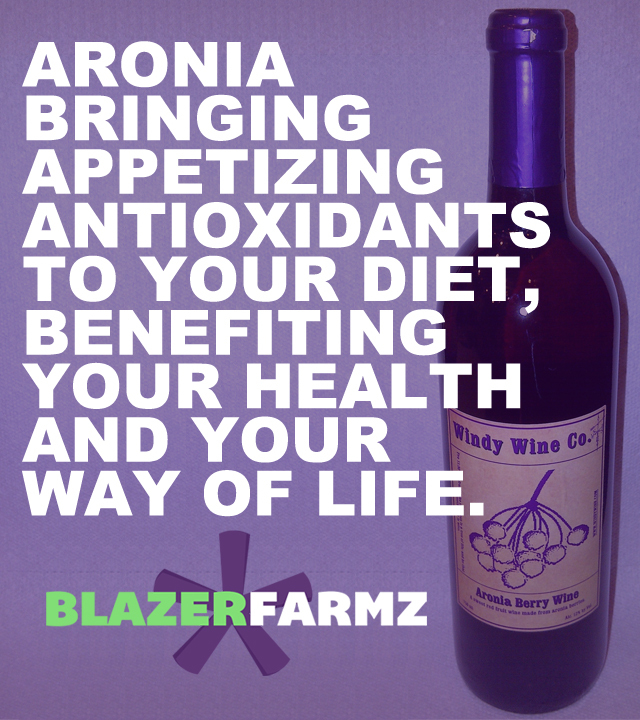 We can supply you the recipe and the raw berries for your next batch of Aronia berry wine or choose our friends at Windy Wine who sell our berries by the bottle. Did you know that Aroniae berry ice cream is a top seller in Poland? Order to get the BEST locally grown aronia from us. Enjoy your milkshake recipe! Directions: Simply combine in a blender, blend and enjoy.